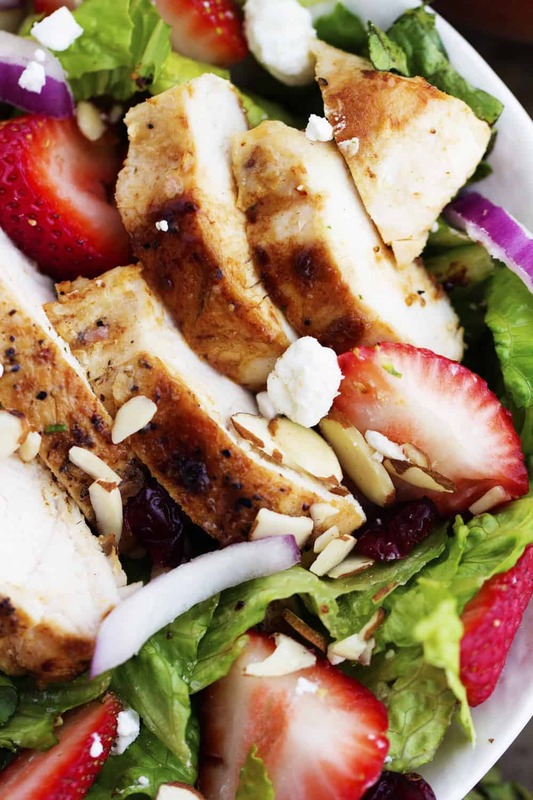 A mouthwatering salad with fresh strawberries, cranberries, goat cheese and almonds. 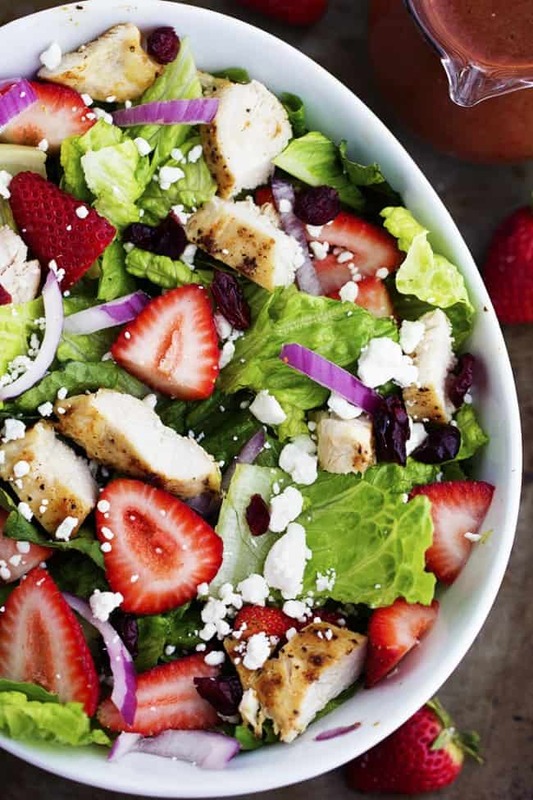 The strawberry balsamic dressing gives it the perfect flavor and is one amazing summer salad! It really is no secret at all that I love a good salad. It has helped me to keep a healthy diet and maintain my goals that I made at the beginning go the year. Of course I have to keep going to the gym and doing crossfit so I can still enjoy a brownie every once in a while, but healthy eating has been key to my weight loss journey. The thing that I love about Crossfit is the support that every person gives. They become your family and cheer you on and help you through each workout. My partner on Saturday helped to push me through each workout and we finished in 57 minutes. It was such an amazing feeling and accomplishment. I can’t believe that I actually did it! It is incredible what we can push ourselves to do if we put our mind to it. We have a little tradition on Saturdays to stop by the Einstein Bagel on the corner after the gym and get some bagels. I gotta have my carbs after a tough workout. 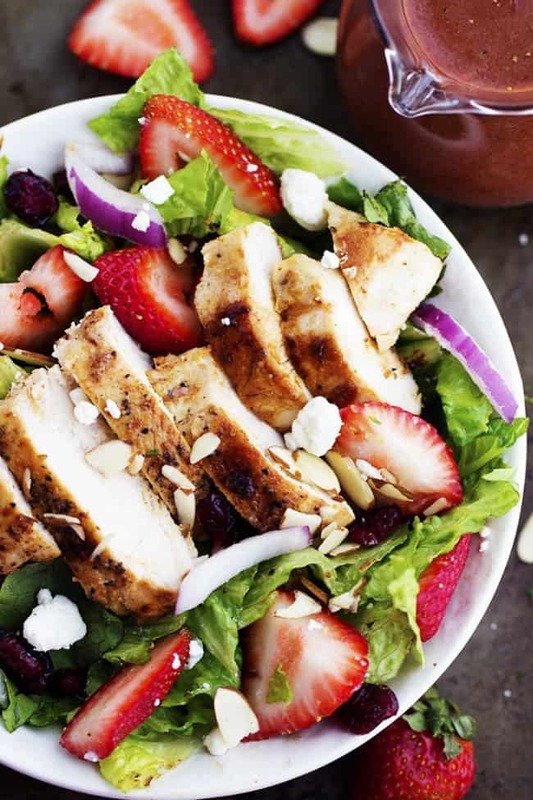 But while I was there I saw a Strawberry Chicken Salad that looked amazing and I wanted to make it immediately! So I got all of the ingredients and came home and made it for myself. It was awesome. Everything about this salad was amazing from the chicken, to the fresh berries, to everything in between. And I decided to top it off with a sweet strawberry balsamic dressing. It was the perfect finishing touch to this salad. This salad is incredible and perfect for the summer with all of the fresh berries inside. I have already made it to days in a row and I know that this will become a favorite for you as well! 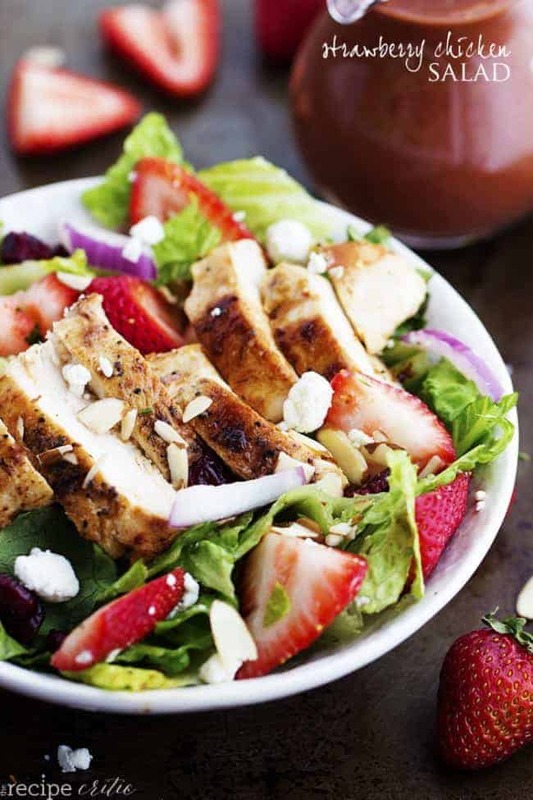 To make the strawberry balsamic dressing: In a food processor or blender, pulse the strawberries, balsamic vinegar, olive oil, dijon mustard, garlic, salt and pepper until smooth. Set aside. That salad is downright delicious. It’s so fresh looking that it’s all I can do to keep hitting the screen with a fork. This salad looks amazing, so fresh and scrumptious! Looks great! What kind of pre-cooked chicken did you use? Enjoying your site. What a beautiful family! Great pictures of all your recipes, too. I’m a Finnish Pancake fan, having learned to make them about 25 yrs. ago in BC, Canada. Too bad hubby & I are eating low carb now, but I can still try out some of the recipes for my 2 young adults. Had this salad for dinner tonight. I used toasted pecans instead of almonds. Fantastic! The picture shows red onion but i dont see it listed as an ingredient. Are there any other things that should be in the salad that i might be missing? I see red onions but did not see them listed in recipe? Thanks for catching that! I used about 1/4 cup sliced red onion. This was WONDERFUL! I made this for dinner tonight for my mother and me. We’ve recently gotten on a salad kick and it’s hot down here in Georgia currently. I wanted something cool for dinner and this was perfect! I will definitely be making this again! I’ve never made my own salad dressing before and the dressing was so delicious and easy to make. I’m not a huge fan of vinaigrettes, but I liked the tangy sweetness that was created when the strawberries were added. I made this for a teacher appreciation lunch yesterday! Everyone loved it but thought the dressing was too sour. When I tasted it, I did think the dressing alone had a lot of balsamic vinegar taste to it. My husband said it should balance out when on the salad but I don’t think it did. Should I just reduce the amount of vinegar next time? Is it 1 tbs or tsp of Dijon mustard? Mine doesn’t look like the pretty red dressing you have in the picture? Yum! Amazing salad! Can’t wait to try this recipe. I will be sharing a link to your recipe in my upcoming post, Easy Healthy Lunch Ideas (on a Budget). I am sure my readers will love your recipe too!